At Heerema Vlissingen, one of the fabrication facilities of Heerema Fabrication Group (HFG), the HelWin bèta jacket for client Siemens, has been completed and sailed today to its offshore location in the German sector of the North Sea. After the EPC (Engineering, Procurement & Construction) contract award by Siemens in 2012 and subsequent completion of the design by HFG’s in-house engineering, Heerema Vlissingen started the fabrication in October 2013. Only 6 months later the 4,500 t jacket, which measures 62 x 42.5 x 42 m (outside dimensions after installation 64 x 42.5 x 48.5 m), has been successfully delivered to our client Siemens. As a result of the fabrication-driven engineering focus of HFG Engineering and optimisation of the fabrication sequence, the Vlissingen yard was able to build the jacket in a record time of only 6 months. To further increase fabrication efficiency the jacket has been built in two parts horizontally and completed in vertical position. 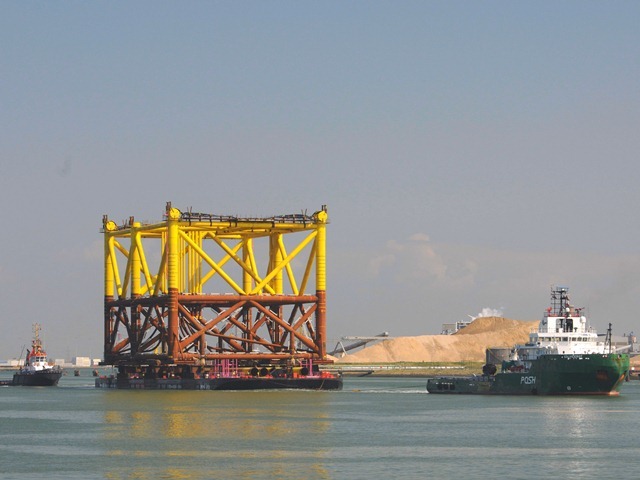 On 31 March the jacket was vertically loaded on the barge, after which the seafastening operations started for safe transportation to its offshore location. The total engineering, procurement and construction activities, including seafastening operations, of the HelWin jacket provided 175,000 man hours direct and indirect employment at HFG Engineering and the Heerema Vlissingen yard without any LTI (Lost Time Incidents). Our sister division Heerema Marine Contractors will perform the offshore transportation and installation by its SSCV (Semi-Submersible Construction Vessel) ‘Thialf’. In the meantime HFG’s fabrication facility Heerema Zwijndrecht is working on the final construction phase of the 10,200 t HelWin bèta HVDC (High Voltage Direct Current) topside, due for completion in the summer of 2014. Koos-Jan van Brouwershaven, CEO of Heerema Fabrication Group, says: “Thanks to our experienced and highly skilled workforce we were able to demonstrate our proven offshore experience to reach this second important project milestone and to deliver the jacket on schedule. The EPC(I) contract with Siemens on HeWin bèta project shows our ability to manage such a challenging and complicated project through all the phases such as engineering, procurement, fabrication and installation. The jacket is part of the HelWin bèta HVDC platform, which is one of the main components of the TenneT DC offshore grid connection 'HelWin2'. The connection with a capacity of 690 MW will connect a large wind farm cluster in the German sector of the North Sea.